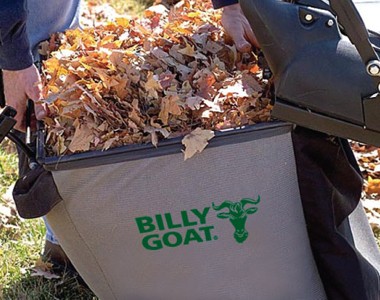 Say goodbye to struggling with rakes and handheld blowers, this Billy Goat MV650SPH Lawn Leaf and Litter Lawn Vacuum has a 29 inch gobbler door that works with the 6 blade impeller to eat up and chew leaves, cans, grass clippings, litter, and debris. Once the leaves are suctioned up, they are sent to a 50 gallon zipperless bag that is the best in class of loading and unloading for less downtime and reduced back pain. 14 inch wheels and a low composite housing allow for easier maneuverability around slopes, uneven terrain, and wet grass. Also, a 3 speed self-propelled system that can be easily adjusted from the operators position pulls this vacuum up slopes and hills with maximum effort. Honda Engine: Pick up debris with ease and move through your lawn quickly with the Honda engine. 29" Gobble Door: The 29 inch gobbler door can be adjusted from the operators position for vacuum control. Open the door wide to suction up a lot of leaves, or slightly close the opening for smaller debris. Self-Propelled Drive System: Simplified operation is available with the 3 speed self-propelled system that is conveniently adjusted from the operator’s position. First gear is perfect for areas with thick leaves and/or slopes. Third gear is great for flat terrain and scattered debris. More power and more suction than previous Billy Goat but doesn't really mulch leaves very well and bag capacity is too small since it doesn't mulch. Would be nice to have a mulching option of some sort and/or a larger bag. Also after only 2 uses a rubber strip between the bag and handle started to pull away and now air and debris blow on to you. Other than that it was relatively easy to assemble and runs great. Good strong unit but would have liked to have options with respect to the type of bag that came with the unit. The stock bag allows massive amounts of dust to come out; so much so that the operator has to wear a mask and other protection gear. Does not make much sense!! It has been 3 days since I sent an email to Billy Goat directly to advise on what other bags are available for the unit of which I have received no response. It would be great if someone from Mowers at Jacks can help me with this. I would try calling but the hold times are very long. 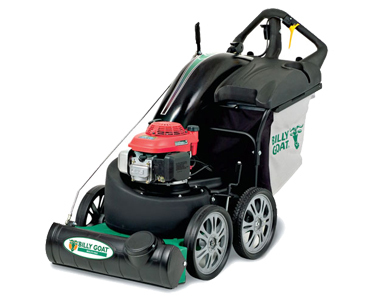 Ask us about the Billy Goat MV650SPH 187cc (Honda) Commercial Self-Propelled Leaf & Litter Vacuum . Please no repair questions. Your Q&A may be posted to MowersAtJacks.com to help other shoppers, like you, with their purchasing decisions. Thank you. Will this pickup acorns,pecans etc? Mike, this should be able to handle picking up acorns and pecans - it is suggested to use for dense, heavy debris such as cans, bottles, litter and other various debris. what is the size of the gas tank and how long will it run on a tank full? Lara, the MV650SPH has a 0.4 gallon fuel capacity. However, Billy Goat does not provide a run time. Can you put a 50 gal bag ( like a 50 gal plastic garden bag )inside the hopper to "tie off" what you've captured so you can set it aside and continue on? Steven, if the included hopper bag would still be able to attach properly to the unit, I suppose you could put a plastic bag inside. Do you sale the hose kit and how much is it? How big and how long? Allen, yes you can buy the hose kit as an option (on right side of product page). 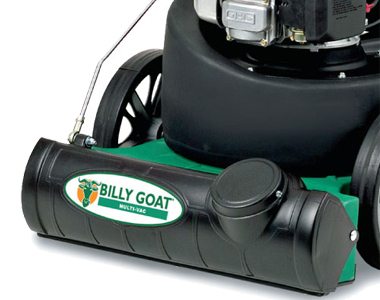 Add options now for your Billy Goat MV650SPH - Litter Vacuum at a 1 time discounted price. When you are ready to check out, just click the ADD TO CART button.